The 17 islands at the mouth of the Fraser River have been many things. From an agricultural hub, to a major boat-building industry, to the city of Richmond we know today. Richmond is home to over 400 restaurants and thousands (literally, thousands!) of commercial properties. Anyway you look at it, that is a lot of roofs. Let our Richmond roof cleaning and moss removal help take care of yours. Although Richmond sees 30% less annual rainfall than the metro Vancouver area, due to being further from the mountains, the colder months bring fog and lots of it. Fog creates moisture which, along with shade, allows for the growth of moss, algae and lichen on the roof of your Richmond property. Whether you own a business or a home, moss growth is unsightly and, left untreated, can lead to permanent damage. Using our Richmond Roof Cleaning Service is a must if you want your roof to last and continue looking its best. Many property owners attempt to tackle moss removal personally. This can be a bad idea if you are unsure of the proper practices. Scraping and the use of corrosive cleaners can accelerate the degradation of your roof, stripping the protective layer. Pressure washing in the wrong direction allows water to access the wood decking causing rot and leaks. 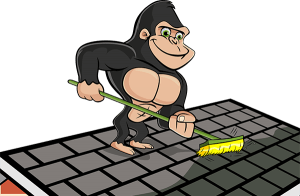 Gorilla Property Services’ Richmond Roof Cleaning Service guarantees the best possible outcome for your property. If your roof is new, regular moss removal and roof cleaning maximises its lifespan and aesthetic appeal. Try our Richmond Roof Cleaning Service on an older roof and the results produced by a little TLC and elbow grease will surprise you.